PHILADELPHIA – Samuel Teah pulled an upset last November at the 2300 Arena that outshined any other during 2018. 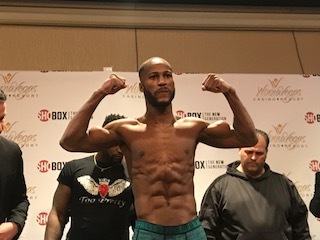 Teah defeated the favored Kenneth Sims, Jr. of Chicago (13-1-1, 4 KOs) with a convincing unanimous decision, and he did it on the nationally televised SHOBOX TV series to boot. Although going into the fight, their records were in the same ballpark (Teah was 14-2-1), Sam was still rebounding from an earlier so-so performance on SHOBOX that had some – certainly Team Sims – thinking that Teah couldn’t perform at the next level. However, Teah surprised everyone and scored the best win of his five-year boxing career. For that feat, he earned his first Briscoe Award. This year’s event will be held on Sunday, April 14, 2019, at Xfinity Live! in South Philadelphia (1100 Pattison Avenue), 1-4 PM. Tickets for the Briscoe Awards cost $10 each, and can be purchased in advance at BriscoeAwards.com, or by calling 609-377-6413.